I’ve never met a stuffing I didn’t like, and this simple stuffing flavored with sage, thyme, onion, and celery can be jazzed up with your favorite additions. Although you can buy herb-seasoned dry bread cubes in the grocery store, I urge you to use stale bread and dry it out in the oven, then add your own herbs. The difference in effort is small, but the difference in flavor is huge! 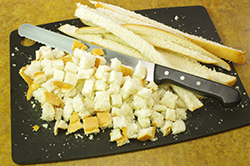 If you are using leftover baguettes with a hard crust, remove the tough parts of the crust, because they will absorb most of the liquid. I like to use a high-quality white sandwich bread like Pepperidge Farm and include the crusts. 1. 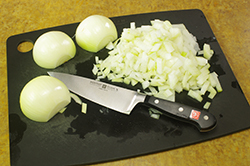 Melt the butter over low heat in a large sauté pan and cook the celery, onion, sage, and thyme until the onion is golden. 2. 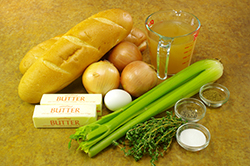 Place the bread cubes, salt, and pepper in a large mixing bowl and add the celery mixture, tossing to blend. 3. Pour the broth over the stuffing ingredients, add the egg, and stir to blend. 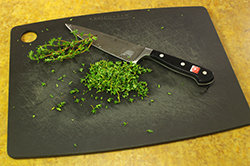 Diva Do-Ahead: At this point, you can cool, cover, and refrigerate for up to 3 days or freeze for up to 1 month. 4. Preheat the oven to 350°F. Coat the inside of a 3-quart baking dish with nonstick cooking spray. Transfer the stuffing to the baking dish and bake for 30 minutes, basting with turkey drippings or butter halfway through the cooking time. 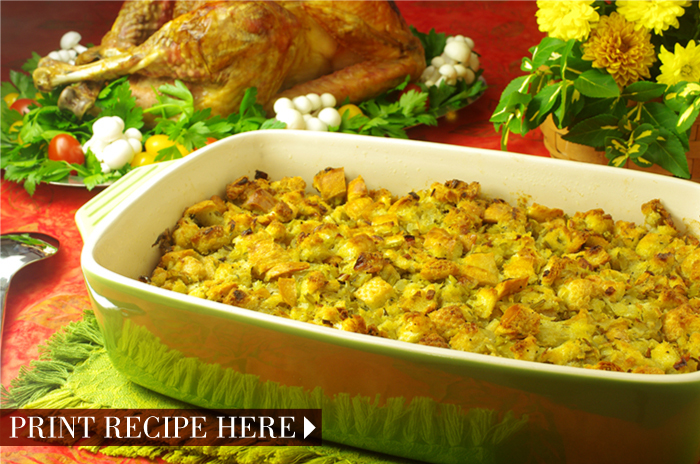 If you put the stuffing into the turkey, it will roast according to the timing charge [in the Turkey recipe]. 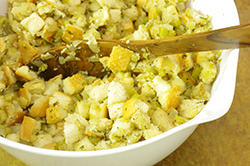 If you like crispy stuffing, don’t drown your bread cubes in liquid, and bake the stuffing outside the turkey. For those who like a moist stuffing, stuff it inside the turkey, or add more liquid to the stuffing and bake it covered with aluminum foil in the oven. 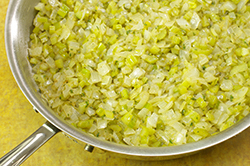 •	1 cup giblets, poached in broth or water for about 30 minutes and finely chopped. 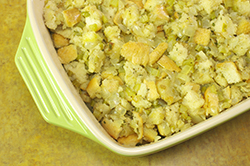 If you are serving a crowd, pack the stuffing into greased loaf pans and bake as directed. Turn the stuffing out of the loaf pans and let rest for 5 minutes. 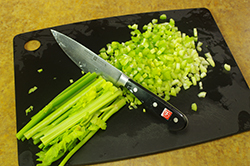 Cut the stuffing with a serrated knife that has been coated with nonstick cooking spray and arrange the slices on a platter. Or, fill 18 wells in greased muffin tins with the stuffing and bake for 15 to 17 minutes, until golden.